Portugal has an ancient tradition of winemaking producing some of the world’s finest wines. With around 500 native grape varieties, and vineyards covering 8 per cent of the land, Portuguese wines are numerous, diverse and distinctive. Along with the most famous exports, Port and Madeira, there is an abundance of notable wine producing regions. Portugal’s wine industry was dramatically modernized in 1986 after the country joined the European Union, and there is now a strict ‘denominations of controlled origin’ (DOC) system. For information on Port and Madeira please see separate articles. The Douro Valley is the world’s oldest appellation-delimited in 1756- and along with Pico Island is now a protected World Heritage site. The upper Douro seems to be an unlikely place for a vineyard: inhospitable hillsides of granite and slate, with no soil and blistering summertime temperatures. 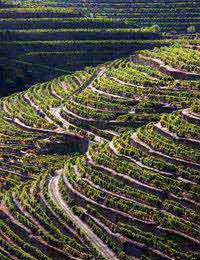 From the 17th century onwards people set about building terraces, which could support vine growth, along the contours of the valley’s slopes. The grapes grown here are used to make the world famous Port (again, see separate ‘Port’ article) and also in the production of Vinho do Douro. Douro wines were originally bitter, but English merchants visiting the region began adding aguardente, a Portuguese brandy, creating a distinctive style of drink. While sharing some characteristics with Port, other Duoro wines are now a favourite and reliable table wine. The intense, bright red Barca Velha, created in 1952, is the finest example of Duoro wine, not only one of Portugal’s finest but also one of the best wines in the world. The name Vinhos Verdes, ‘green wine’, refers to the typical youthful freshness of these wines, made in the far northern region of Minho. These light, fresh wines owe this greenness to very little or no ageing process, and while not classified as sparkling often display a definite pétillance. The region was only officially demarcated in 1908, but in reality it has an ancient history of making wines that are unique to Portugal. Vinho Alvarinho, made with Albariño grapes, is a notable variety of Vinhos Verdes. With 11-13% alcohol by volume it is slightly stronger than most of these wines, which are usually around 8-11%. Dão wine is made in Região Demarcada do Dão. This northern region was demarcated in 1908, but had in fact introduced measures to protect its wine as far back as 1390. The mountains that huddle around the Dão and Mondego rivers create a warm climate defended from coastal influences. Dão wines, both red and white, are jam-packed with fruit flavours and are typically 11% ABV or stronger. Many Dão vintners lay claim to making the finest Portuguese table wines, and examples such as "Grão Vasco" and "Aliança" are indeed very admirable. The region of Bairrada takes it name from the clay- ‘barros’- of its soil. This clay and lime richness lends body and bite to the red wine made here. A moderate climate frequented by sea mists tempers the wines’ acidity and provides balance. The local grape Baga is loaded with tannins, making rich, deep reds that are ideal paired with Portuguese Leitão da Bairrada- roasted piglet. Most Bairrada wines are red, but there are noteworthy naturally sparkling wines, officially branded as "Conde de Cantanhede" and "Marquês de Marialva". The Setúbal Peninsula is home to vineyards that specialise in sweet, liqueurous Moscatel wine. The region has been making wine for centuries, records from 1797 mention these drinks but their history is much longer. All Setúbal Moscatels are grown and made with special care; the best known is ‘Moscatel Roxo’ which is cellar aged for at least 20 years before sale. The wines of the Alentejo region are the preferred drink of Portugal’s domestic market, accounting for 47% of the market. Located in the south of the country, the climate here is ideal for producing distinguished quality wines, which are refined and accessible to the occasional wine drinker. A nose of ripened fruits and soft, balanced flavours mark out the predominant Alentejo reds. The whites are also fruity with an intense bouquet. Colares ‘sand wines’ are made in the sandy soils of the land near Lisbon. As Lisbon has grown the land available for vines has shrunk, to the extent that Colares wine is very rare, and as such a much sought after and expensive tipple. The wine is highly tannic and spicily exotic with a fascinating, ethereal bouquet. If you stumble across a bottle of Colares be sure to snap it up and savour its increasingly scarce delights.